Add to Shopping List +	 1 x 360g can caramel. Add to Shopping List +	 125ml (½ cup) cream. Preheat the oven to 180°C. Line a 12-hole cupcake pan with cupcake papers. Place the Stork and sugar in a bowl of an electric mixer with the whisk attachment. Cream until light and fluffy. Add the eggs one at the time while mixing. Lower the speed and sieve in the self-raising flour, cocoa powder and coffee granules. Fill the cupcake holes 2/3 full. With the back side of a teaspoon press the batter in the middle. So that the cupcake bakes evenly. Bake in the oven for 15-20 minutes turning the pan once after 10 minutes. Test the cupcake with a cake tester if it comes out clean it is ready. Remove from the oven and leave to cool down completely. Cut the top off each cupcake (keep the top) and hollow the cupcake out slightly. Fill the cupcake with about 2 tbsp. of the caramel and place the top back on. For the icing; cream the butter and icing sugar until light and fluffy. Add the caramel essence and stir until well combined. Ladle the icing into a piping bag fitted with a star nozzle. For the caramel drizzle; combine the brown sugar, Stork and cream in a saucepan over medium heat, stir until all the ingredients are dissolved. Bring to the boil and cook for 2 minutes or until the sauce is thickened, remove from the heat and allow to cool. 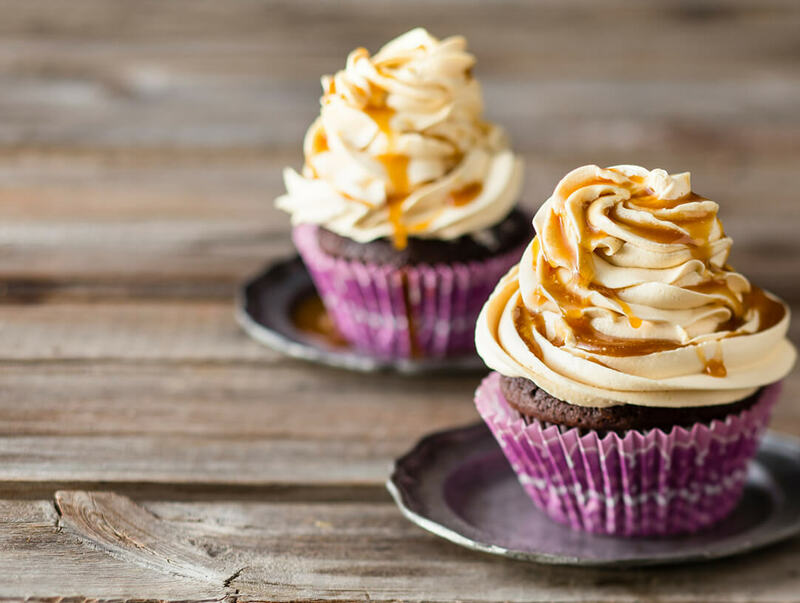 Pipe the cooled cupcakes with the caramel icing and drizzle with the caramel.